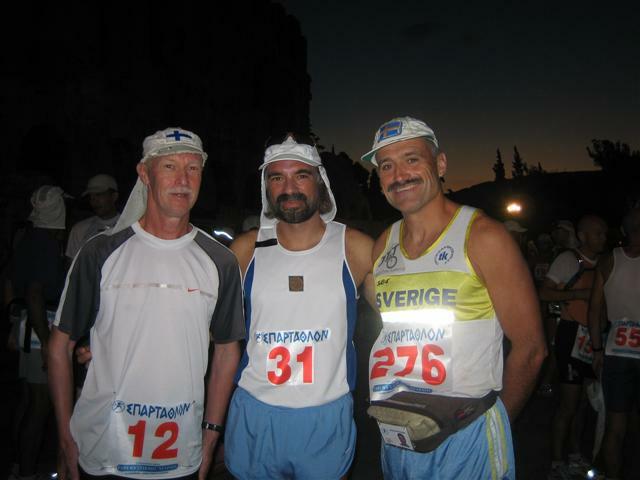 All the advice I am going to give you here are based on 10 completed Spartathlon races. The cutoff times are rather challenging. One needs a good margin to his or her maximum capacity. If you can not break 10 hours in 100 kilometers, you will have a rather slim chance to make it all the way to Sparta within 36 hours. If you can run 100 kilometers faster than nine hours, you have reasonable odds. Carry as little as possible during the race. A fanny pack is the absolute maximum cargo you should haul. Forget about waterbottles and other such things! You will need some kind of lamp during the night. A small torch will do, but a headlamp is the ultimate. Instead of carrying equipment, you can leave drop bags. This is how I used to distribute my bags, based on an assumed finishing time well below 30 hours. First bag: The checkpoint after Akro Nemea, about 127 kilometers in to the race. The bag contains a torch or a small head lamp. Also in the bag is a small amount of toilet paper, and maybe some salt. The reason for dropping the bag off here is that there will be so many bags at Akro Nemea, and that it will be smarter to stop there as short time as possible. It will be much easier to find the bag at a small checkpoint. In 2006, I struggled with tha cutoff-times and darkness fell when I had run 102 kilometers and passed the checkpoint number 29 in the village Zevgolatio. It can be adviced that slow runners leave their dropbag with the torch there. Second bag: Malandreni, at about 145 kilometers. The bag containing a t-shirt. The night can be a bit cool, but most likely not cold. Third bag: About 220 kilometers checkpoint. Bag containing a t-shirt. The purpose is to have a bag to drop the torch or headlamp in, and the t-shirt is used to protect the lamp. Eat as much as possible during the run! You will not feel hunger, but you will need the food. Eat a little at many checkpoints. That is probably better than eating a lot a few times. Try to vary the foods. You will be sick of the sweet taste of energy bars, so don’t rely exclusively on one kind of food. Rice pudding, yoghurt, bread, and crackers can be found at most aidstations. Avoid soup! It will most likely be some kind of instant soup, not sufficiently cooked. But if yu can be guaranteed that the soup is home made, then you should eat it. You will turn over about 25% of your body weight in water during the race. This enormous amount of sweating and drinking will deplete your sodium, and possibly potassium, stores. You will benefit from taking sodium during the race. If you can not find sodium chloride pills, you can carry a small salt-shaker in a fannypack, or put them in every drop-bag. If your urine is clear and if you urinate frequently, you might have the first stages of hyponatremia. If so, you must ingest some salt, and drink less (maybe not at all for some time). Spend as little time as possible at the aid stations! Grab what you need, get away immediately, eat or drink as you move toward Sparta. There will be 75 aid stations, each of them a potential time waster. e.
You will most likely get some kind of stomach problem. That is normal. Remember that your stomach will receive enormous amounts of fluids and food, at the same time as the body’s blood flow is directed to the working muscle. If you get stomach problems, don’t get upset! Give it time, because you will probably be all right again after a while. Many runners have dropped out unnecessarily due to temporary stomach problems. You can count on feeling sick at some time, but you can also count on recovering from it as you run. Fatigue is also a very natural condition. If you can not accept severe fatigue, don’t even think about running Spartathlon! You will go through stages. Sometimes you will be very tired. But you will also feel better after a while, only to get tired again, and so on. However, toward the end of the race, you will be fatigued. Enjoy the exhaustion! Only those who are really mentally strong can push themselves in to extreme exhaustion. You should strive to be one of them. If you want to take some of the top places, you should run up almost every hill, except a few really steep ones. But if your ambitions are less competitive, you can use the up hills to get a walk break. If you walk all the up-hills and run efficiently where it is flat or downhill, you will have a great chance to finish. If you feel fatigued, walk a bit! Perhaps you should walk as you eat, and give it some time of walking after you have finished your meal. I would be skeptic to deciding to run with somebody. You two (or more) will go through stages of fatigue and problems at different times. Run your own race! Set a clear goal. The goal should be related to Sparta. I used to have the Sparta Hospital as my goal. If I ran hard enough, I would be taken by ambulance to the hospital, where the doctor and nurses would give me the best care a collapsed runner could ask for. When I got exhausted towards the end of the race, I enjoyed the sensation, because it was a clear sign that I was on my way to being worthy an ambulance ride after touching the statue of King Leonidas. Make a mental budget. Take in to account that you most likely have to deal with heat, blisters, upset stomach, and profound exhaustion. No problems! You can handle all of that, and you will not be caught by surprise by anything. Just push on towards Sparta! Enjoy the run, because there is an enormous amount of beauty in the landscape, and you will meet many great people, some of them are fellow runners. Enjoy Spartathlon. Keep in mind that Spartathlon is the greatest race on this planet!